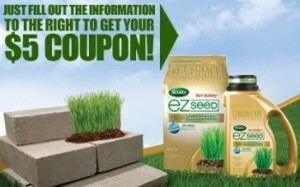 I’m not sure the cost of this but there is a $5.00 coupon for Scotts EZ Seed. I might have to give this a try as we have an area on our lawn that we just can’t get grass to grow well. This just may do the trick. You can head over here to print your coupon. Has anyone tried this? Would love to hear how it works. Free Glade Relaxing Moments Gift Basket From Right @ Home – Hurry!